Growing up near Boston, I was very lucky to be introduced to the icy cliffs and mountains of northern New Hampshire – a great training ground for Alaska – when I was young. Since a few friends and I ventured up Denali at age 20, my obsession with the Alaska Range has drawn me back to my favorite place Earth for nine expeditions over the last five years. 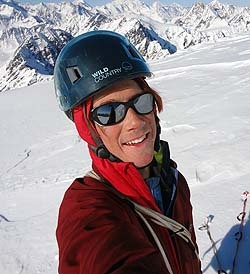 In addition to six trips up Denali’s West Buttress, my favorite memories in the Range include climbing the 3,000′ ice route “Ham and Eggs” on the Mooses Tooth, and an attempt to guide Denali’s complex West Rib. Outside of Alaska, I spend most of the year guiding on the incredible rock and ice around North Conway, NH, where I also volunteer on the North Conway Mountain Rescue Service. When I’m not wearing crampons, I can be found working as a licensed EMT-Basic (and WEMT) in a hospital or on an ambulance, or driving my valiant Astro van, “Van Go”, back to Alaska!